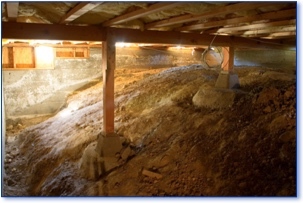 Many homes have crawl spaces instead of – or in addition to – a full-fledged basement. If your home has a crawl space, then you're probably aware of what a challenge it can be to keep this area clean, dry, and healthy. The safety and integrity of one part of the home affects all the other areas of the structure. 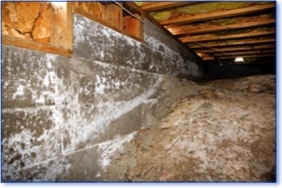 A crawl space in need of repair, cleaning, or waterproofing is not something that should be ignored. Maybe your crawl space needs improvements in ventilation. A lack of proper ventilation encourages high humidity levels which in turn encourages mold growth. Mold growth and water that infiltrates through a dirt floor or poorly laid concrete slab are two of the biggest areas of concern in the crawl space of a house or building. Mold is a dangerous irritant with potentially devastating negative health effects – especially for growing children. And crawl spaces with dirt floors or even deteriorating concrete can act like a neon welcome sign to all manner of bugs, rodents, and wildlife – leading to infestation and additional health risks to your family. Any home can have a clean, dry, and healthy crawl space. We've been proving that as full-service providers of custom moisture solutions for more than three decades. Get in touch with us today and one of the actual Real Dry owners will come to your home or business and perform a FREE, no-obligations inspection. We'll assess your problem, make the best recommendations based on our significant experience, and give you a written quote. Unfortunately, it's been our experience that homeowners often underestimate the importance of maintaining a safe, healthy crawl space until it's nearly too late. Don't be that person! Call us at 1-855-DRY-TODAY for a FREE inspection and quote for a dryness solution in MA, northern CT & RI, and southern NH. Or send us an and we'll get back to you right away.